Milos is known as the “island of colors” due to its multicolored palette of landscapes and unique geological formations, the obsidian stone and its coastline of spectacular beauty and charm. It is also known as the place where the statue of “Venus de Milo” (Aphrodite) was discovered, an ancient Greek sculpture that is today hosted in the Louvre Museum in Paris. 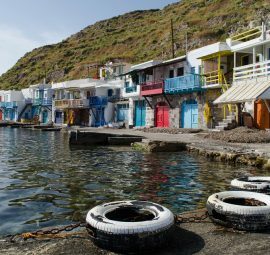 It is only recently that the island has been noticed for its astonishing volcanic shorelines, its colorful landscapes, exotic waters and beaches of every shape and color, its spectacular sunset views and picturesque villages, making it an off the beaten track, but still easily accessible island that is connected to most other Cycladic destinations. 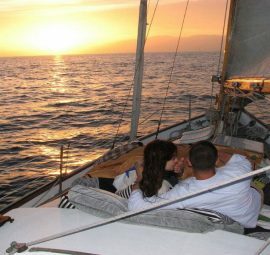 The island’s unique relaxing atmosphere is perfect for serene getaways and romantic escapes for couples, but also for anyone who wants to experience the real, extraordinary beauty and peaceful holidays. Ancient Theater: is located on a slope near the famous Catacombs in Tripiti village and was built in the 3rd century by the Romans. The marble open air theater was used to host theater festivals in the Hellenistic period. Nowadays, the theatre has been restored and is used to organize numerous cultural events. The site has a beautiful view to the port of Adamas. 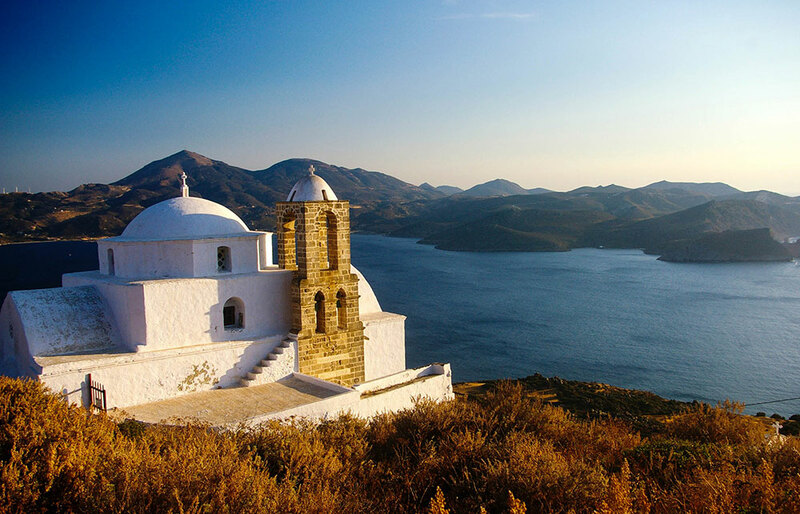 Kimolos and Polyaigos neighboring islands: are located in the southwestern part of Cyclades next to Milos. 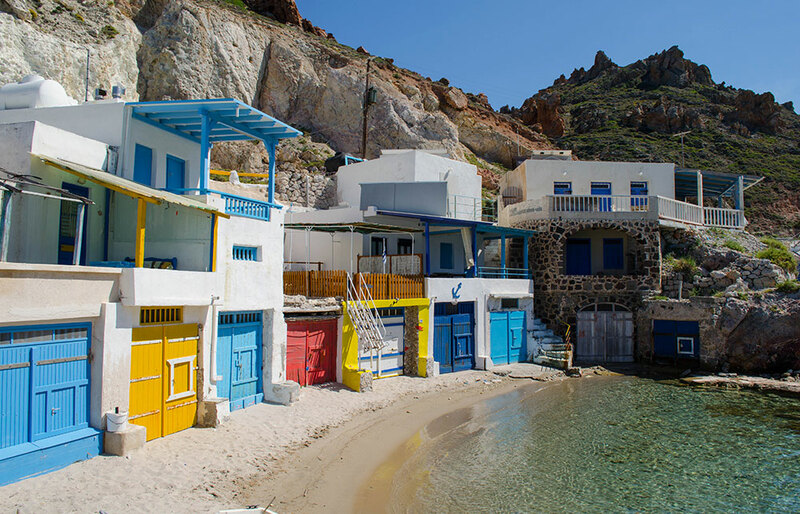 The charming and picturesque island of Kimolos with its enchanting beaches and the turquoise waters (so-called, “Galazia Nera”) of Polyaigos would be a great omission if not visited when in Milos. The Catacombs: This is probably the most significant archeological finding on Milos. Dating from the 1st - 5th century, Milo’s catacombs are among the three most important Catacombs of Christianity discovered worldwide together with the Catacombs of Rome and the Holy Land. It is likely that the Catacombs of Milos are older than the ones of Rome. The Catacombs are situated southwest of the village of Tripiti and were used as Christian cemeteries during Roman times, where thousands of people were buried. The Mining Museum of Milos: is located in Adamas, the island’s main port. 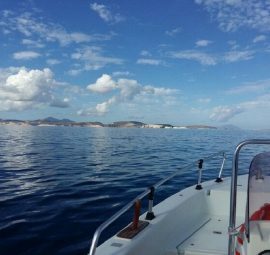 The museum aims to promote the rich geological and mining history of the volcanic island of Milos. The mining activity in the island began in pre-historic times and continues until today. 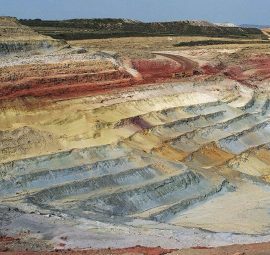 There are approximately 200 mines all around Milos that mostly mine kaolinite, bentonite, perlite, silicates and pozzolana, making mining a big part of the island’s economy and culture. 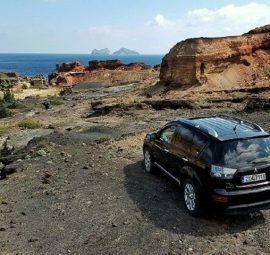 Thiorichia (sulfur mines): The abandoned venue used to be the oldest sulfur mine in Greece, located at Paleorema beach. Although the mine stopped production in the late 1960’s, it is now an open-air museum where one can see all the mining remains including transportation facilities, deserted offices and tools that will travel you back in time. At the beach of Paleorema you will find yellow pebbles, indicative of the sulfur mines. In fact the sulfur and rust have given the whole area vibrant earthly colors of red, yellow and brown. 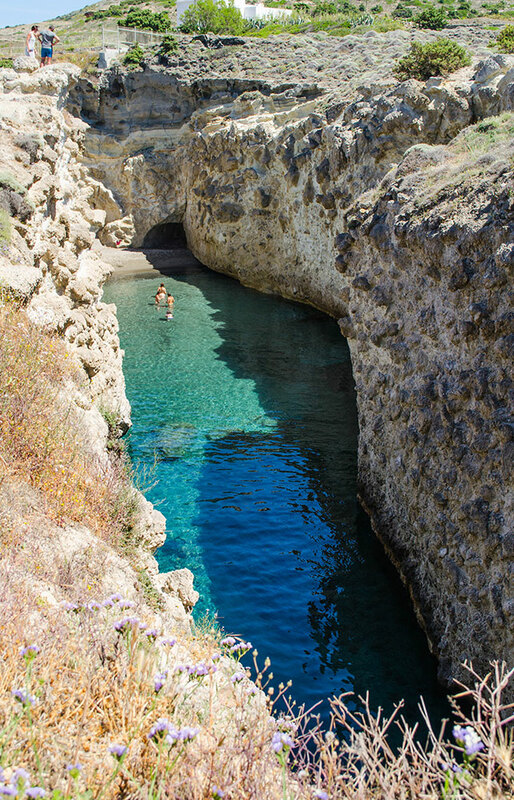 Kleftiko, Sykia and Papafragas sea caves: impressive locations with dramatic rock formations coming out of the sea, forming natural caves and underwater passages. Definitely a must see! Sarakiniko beach: lunar landscape beach with grayish-white volcanic rocks that shape a moon-like planet and emerald waters. 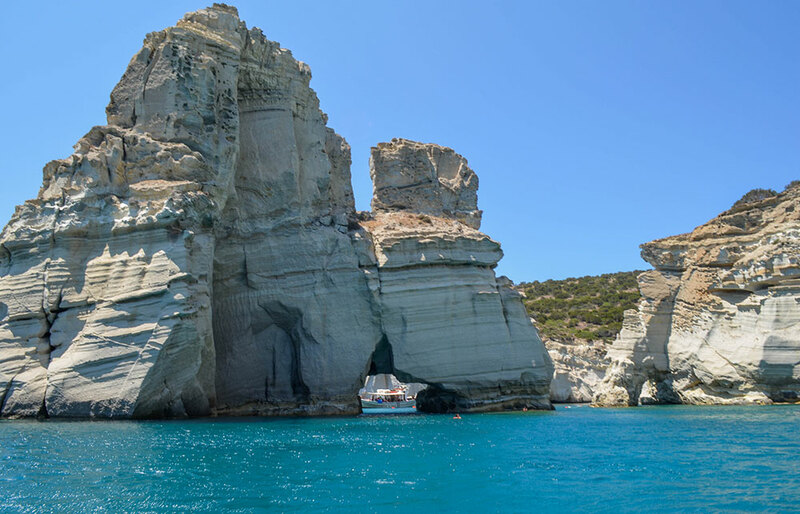 Arkoudes (Bears): is a group of rocky islets located off the coast of Milos, near Platheina beach. The rocks are abrupt and sharp about 20 feet high and look rather like bears, hence their name. They can only be reached by boat. Adamas is the main port of Milos and is considered the safest natural port in the Aegean. This white washed seaside village becomes vibrant in the summertime, and offers a combination of relaxation and calmness in the daytime with some nightlife and entertainment. The area is surrounded by many beaches, various hotel units, cafes, bars, restaurants and shopping district. It has many old churches as well as mining and church museums that are worth visiting. 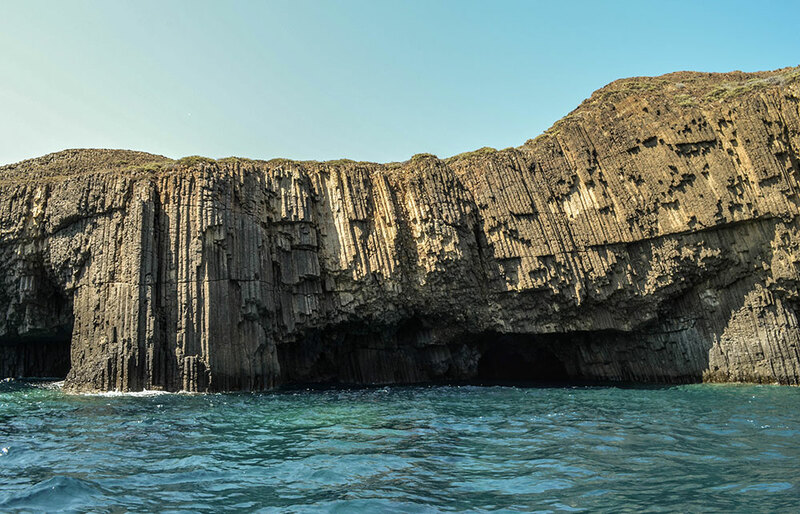 Right at the Adamas harbor, there is the only exploitable and recognized therapeutic hot–spring of the island, the “Hippocrate’s Cave”. This newly built cave–shaped thermal spa resembles the ancient Catacombs and is worth paying a visit during summertime. Small fishing villages famous for their characteristic architecture called “syrmata”, traditional boat parking lots or houses, situated right at the sea with various brightly painted doors and living quarters on the upper floors. A must see! 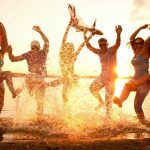 Locals host a lot of festivals in these picturesque areas, where fresh fish and drinks are served all night long accompanied with local music and dancing. Plaka is the capital of Milos and one of the most intact capitals of Cyclades with infinite beauty that you must visit and explore. 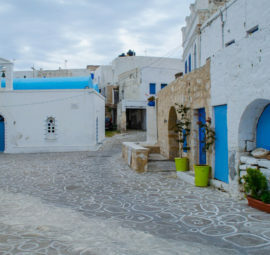 The village has a traditional Cycladic architecture, whitewashed houses, colored windows and doors, balconies full of flowers, shopping district, art galleries and narrow white alleys. On the hill top of Plakalies an imposing Venetian Castle and the Church of Thalassitra, offering panoramic views to the bay of Adamas and unforgettable sunsets, comparable even to Santorini’s sunset known worldwide. Here you will find the Folk Museum and the Archaeological Museum along with other imposing churches. 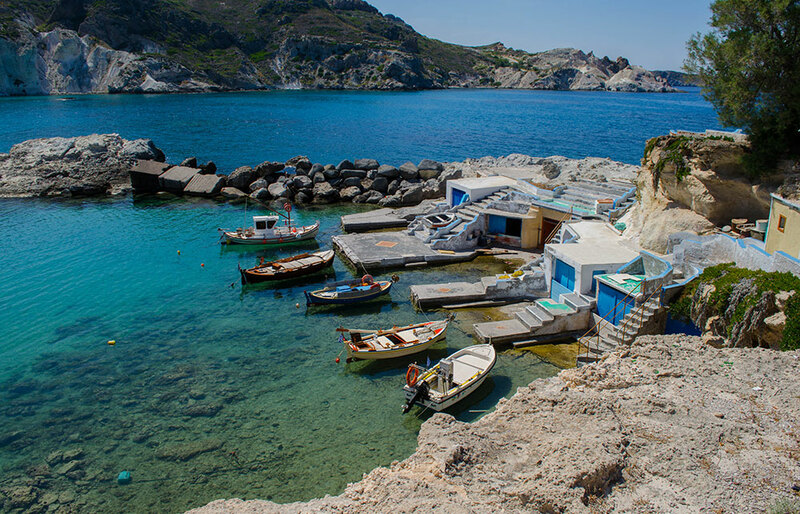 Pollonia is a picturesque fishing village that has lately become very popular among visitors as it offers abundance of accommodation, including cave-style boutique hotels along a sandy beach with azure waters and fine sand on the north side of the island. The village most probably got its name from the temple of Apollo that existed in the settlement on the lighthouse of Pelekouda. The area of Pelekouda, by far, one of the best sunset spots of the island, where you can also find two stone chairs which according to tradition promise that the couple who sits there will be together forever. Pollonia is very fashionable and busy coastline with plenty of gourmet restaurants, traditional tavernas, bars and cafes that stretch up between the churches of Agia Paraskevi and Agios Nikolas at its two ends. 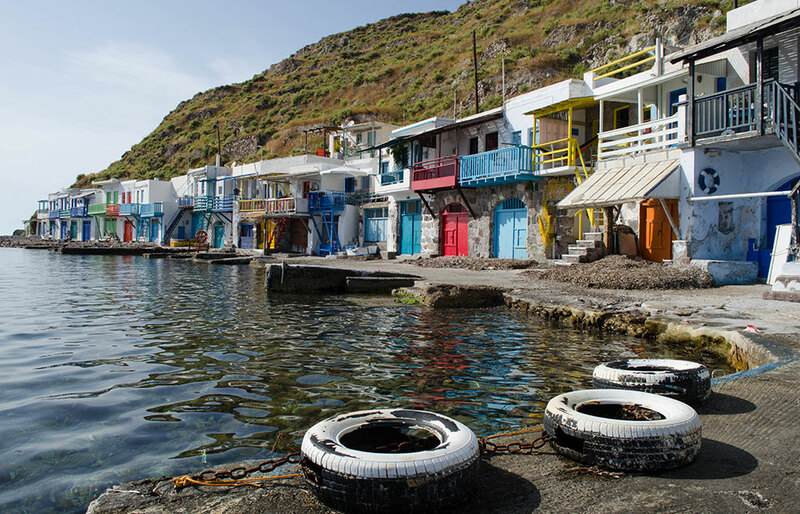 Pollonia also serves as a departure port for daily local ferry to Kimolos which runs all year round, or if you take a private boat it is also possible to visit Polyaigos, and Glaronissia, the small volcanic islands with impressive rock formations coming up from the sea. Trypiti is a traditional village near Plaka built amphitheatrically on the ruins of the classic city of Klima. The church of Agios Nikolaos dominates the center of the village while picturesque white windmills stand on the highest point of the village and some of them have been turned into elegant houses for rent. In Trypiti you can enjoy some beautiful local dishes at the restaurants as well as a spectacular view of Adamas. On a short walking distance you will also find the Catacombs and the Ancient Theater. Off the road to the Catacombs, a dirt track will lead you to the spot where a farmer found the Venus de Milo in 1820. 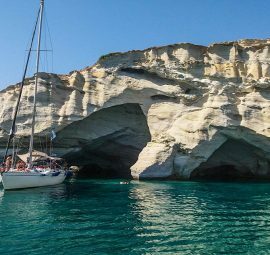 Agia Kyriaki: is a beautiful beach in the southern side of Milos with fine sand and pebbles and crystal cyan waters. Although its wild rocky landscape gives the beach an unspoiled character, Agia Kyriaki is organized with beach bar, sun beds, umbrellas and a beach canteen. Alogomandra: is a long sandy beach right next to the small port of Agios Konstantinos. Alogomandra is known for the unusual rocky arch in one of its ends, forming something like a semi-cave. The beach has fine white sand and turquoise waters and is completely unorganized with no beach facilities or cafes. Firiplaka: lies right next to the lovely beach of Tsigrado. 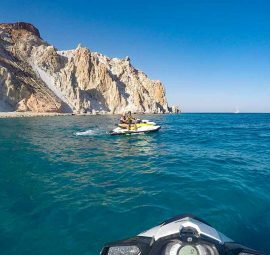 This endless beach with huge white-yellow colored rocks right behind its coastline and exotic green blue waters enchants even the most demanding of travelers. The stunning Firiplaka is organized and offers sun beds as well as a beach bar, while attracting a lot of visitors due to its unique beauty. A must see! 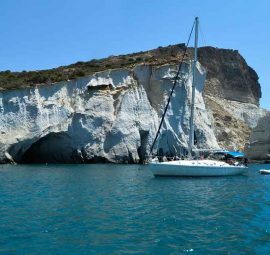 Kleftiko: is an impressive location with dramatic vertical rocks coming out of the sea and forming natural caves and underwater passages. 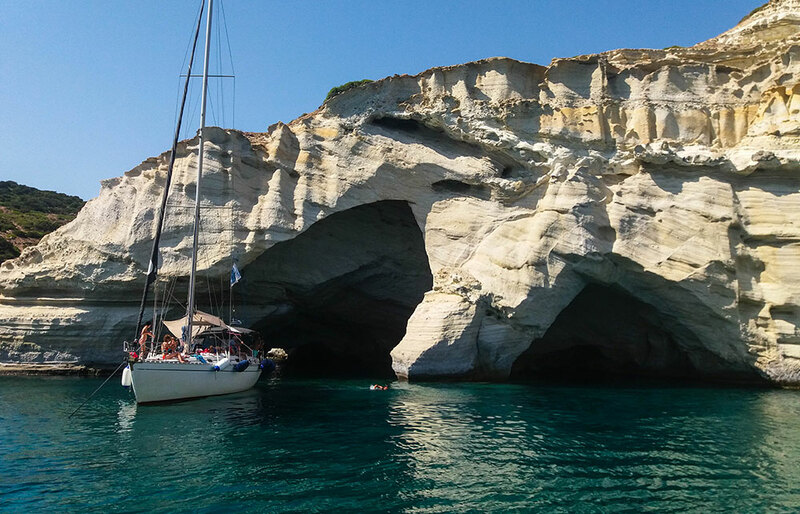 It is one of the most photographed places in Milos. 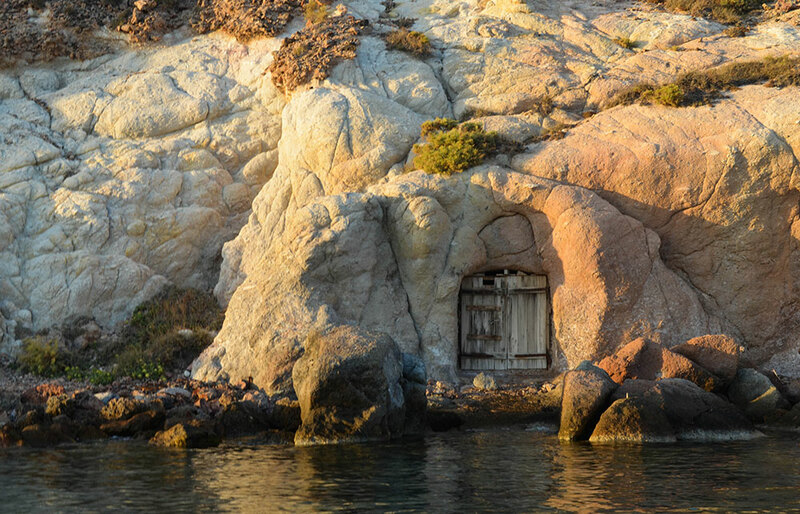 Legend has it, that one of the caves was a pirate hideaway and their treasure is still hidden there. In winter seals find refugee here. 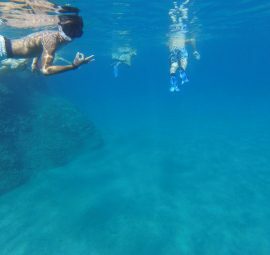 Kleftiko’s crystal blue waters and unique white-shaped landscape are ideal for snorkeling and cave exploring. Paleochori: is a colorful natural canvas of golden sand, colorful pebbles, vivid red rocks and cyan waters. 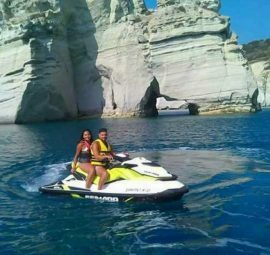 Paleochori is one of the most popular and organized beaches of Milos, with several taverns, beach bars, sun beds, umbrellas and water sports such as water tubes, canoes, skis, water cycling and wakeboarding. It is located 10 km south of Adamas. Papafragas: is a small sandy, almost secluded beach situated within a rocky cave. As this tiny beach is confined by light-colored rocks this sheltered landscape it resembles a gigantic swimming pool with cyan waters worth visiting. In order to reach Parafragas you will have to go down a steep carving on the rocks. 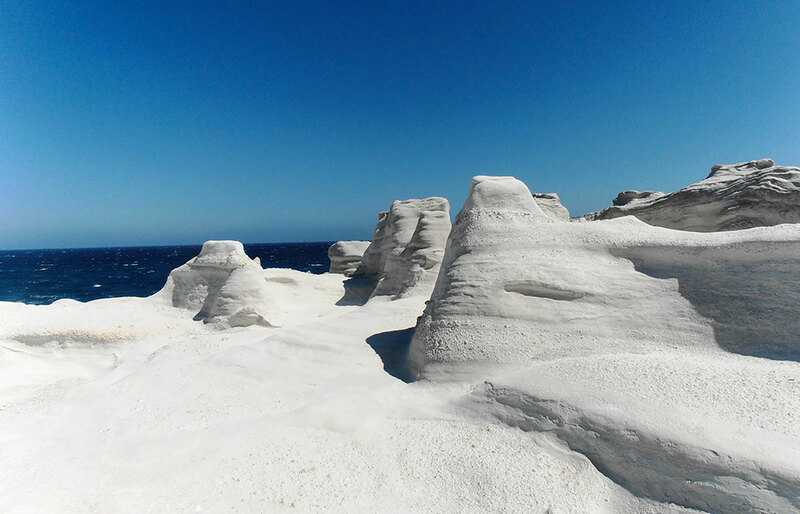 Platheina: is located on the northern side of Milos. This lovely beach has fine white sand and beautiful emerald waters and provides the perfect spot for relaxation due to its great atmosphere. Platheinahas sun beds and a canteen available and can be accessed by a dirt road. 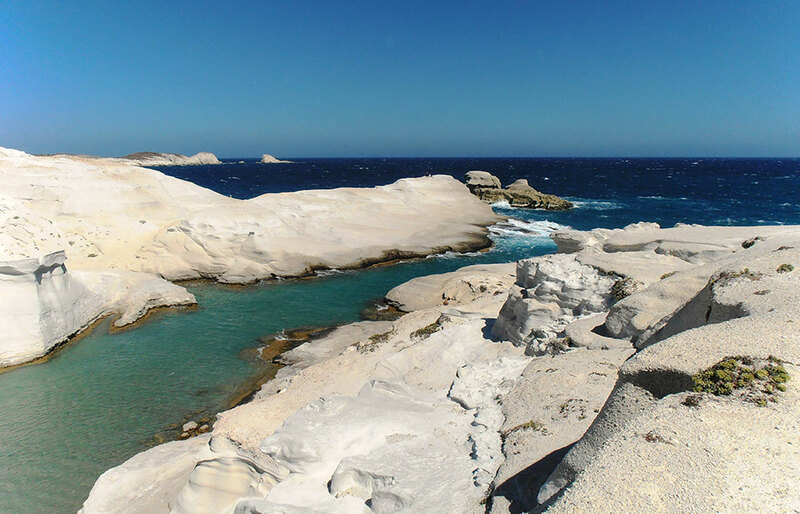 Provatas: is a beautiful yellow sandy beach with shallow crystalline waters on the south eastern side of Milos. Provotas is an organized beach ideal for families and relaxing swims. 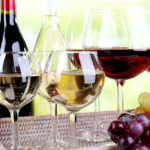 It is quite popular during the summer months and offers various amenities including several hotels and restaurants. 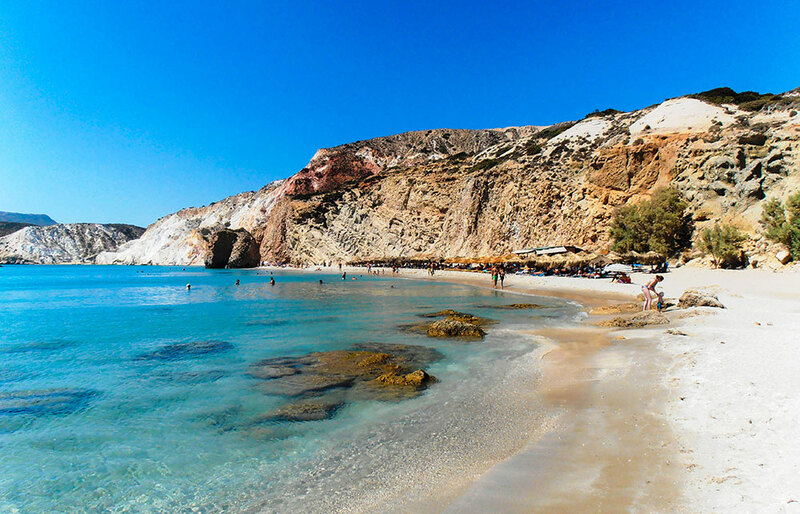 Sarakiniko: is one of the most beautiful beaches in Milos and one of the most photographed beaches in the Aegean Sea. The magical landscape of Sarakiniko gives the feeling of standing on the surface of the moon. The beach is formed by long horizontal volcanic rocks in bright white color filled with natural shaped hollows creating an unforgettable landscape. The scenery gets even more interesting with the contrasting turquoise colors of the surrounding waters. The beach is unorganized and ideal for sunbathing and snorkeling. A must see! Sykia cave: is a narrow, long beach hidden under a sea cave with a collapsed roof. As a result the roof has a big round hole from which the sky can be seen and the sunlight comes into the cave and lights up its emerald colored waters. Sykia is close to Kleftiko on the west side, and is only accessible by boat. 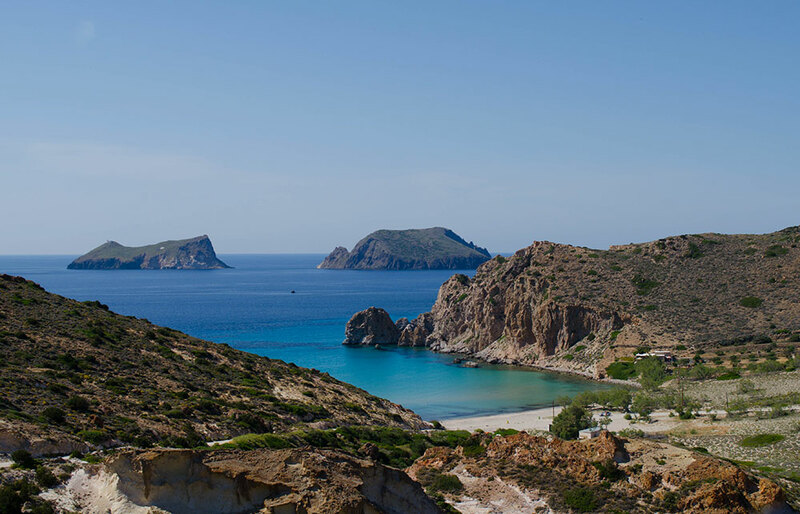 Tsigrado: is a small cove in the southern side of Milos, next to Firiplaka. The access to Tsigrado is difficult, as visitors have to descent through a very steep and narrow rocky passage and a vertical wooden ladder in order to get there. The emerald waters and the impressive unspoiled red-colored scenery are worth the trouble of going down this beach; however access is also possible from the sea, for those who are not feeling adventurous enough to try it. 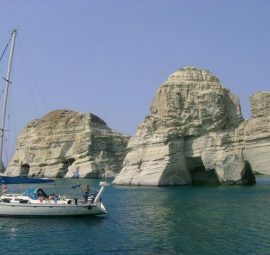 According to mythology Milos was the island of Aphrodite, the Goddess of beauty and love. 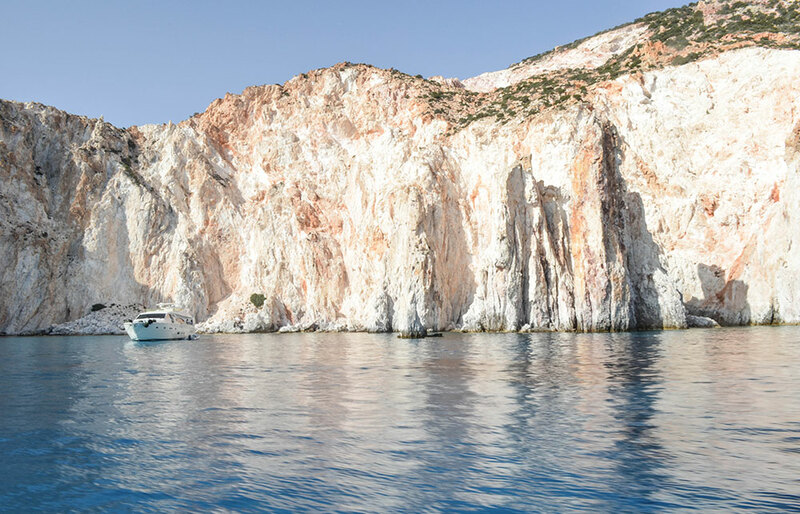 Legend has it that Milos was the son of a royal family in Cyprus and was sent by Aphrodite to inhabit the island after the suicide of his parents. There he developed the first colony and the island was named after him. 7000 BC – 3000 BC: Milos has been inhabited since the Neolithic age and developed rapidly due to obsidian, a volcanic stone hard and sharp as glass used by the Melians for the construction of tools, blades and weapons. At that period, obsidian was considered a precious stone and was exported to the Aegean islands, Crete, Peloponnesus, Thessaly and the Asia Minor. 2800 BC - 1100 BC: The settlement of Phylakopi was established on the northeastern side of the island, and becomes the trade centre of obsidian. The city of Phylakopi thrived for over 2 millenniums and created a superior civilization. 1000 BC: The Dorians settled in Milos and a new settlement was built in Klima. The new town developed rapidly in arts and crafts, and the famous Melian vase was introduced. 415 BC: The Melians remained neutral in the Peloponnesian war, and the Athenians forced them to leave the island, by killing the old people and selling the young men, women and children for slaves. They returned only after the Spartans defeated the Athenians. 311 BC: Up until 311 BC, Milos was ruled by Macedonia and then Egypt. During this period Milos saw economic and cultural growth and the famous statue of Venus (hosted at the Louvre Museum in Paris) and the imposing statue of the Poseidon (displayed in the National Museum in Athens) were created. 197 BC: Milos came under Roman influence. The island accomplished great prosperity, its inhabitants became very wealthy and a number of new buildings were constructed, including the Ancient Theatre. Christianity also made its appearance during the first century and Catacombs were built for religious rituals and burials. 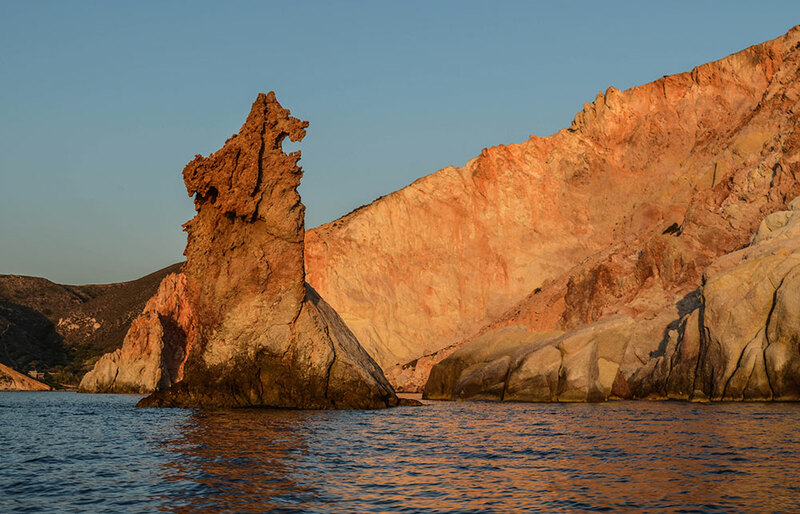 After the decline of the Roman Empire, Milos passed on to the Byzantine Empire, along with the rest of the Cyclades. 1207 AD: The Venetian took over the Aegean. 1268 AD: The Melians rebelled against the Venetians, but failed since the Byzantine fleet never came to their aid. 1566 AD: The whole Cyclades area came under the Turkish control. All the years of Turkish rule, Milos was never occupied by the Turks, only inspected by them on how the islanders lived. 1771 AD: Milos and nearby islands fell under the Russian control. 1774 AD: The Turkish rule was re-established. 1821 AD: Milos was the 3rddistrict in Greece to rebel against the Turks. 1912 AD -1922 AD: During the World War I, Milos Gulf was used by the British and the French fleet as naval base and Adamas was used as headquarters for Allied Command in the Aegean. 1941 AD: Milos was ruled by the Germans but won back its freedom in 1945. Festival of Agia Marina: is held on July 17th in Achivadolimni. 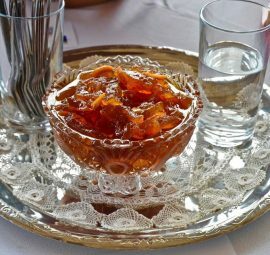 Festival of Agios Panteleimonas: is celebrated on July 27th in Embourios. Festival of the Panagia (Virgin Mary): is held on August 15th in Adamas. 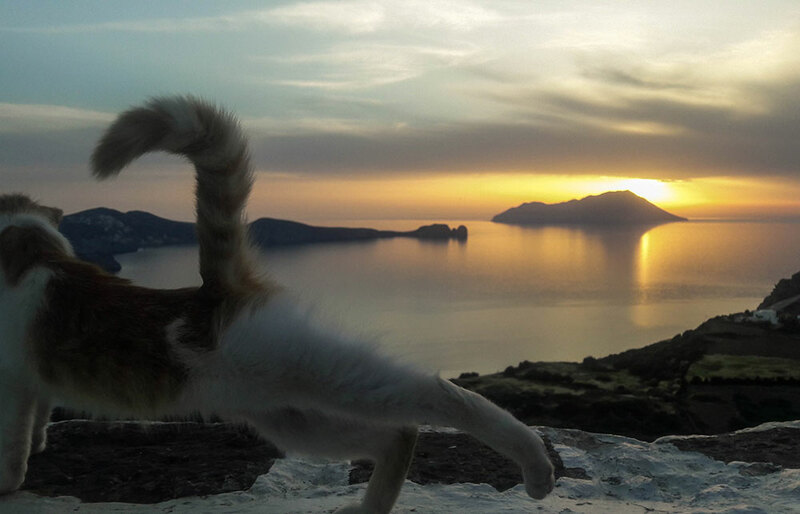 Festival of Agios Ioannis Theologos: is the most important event in Milos and is held on September 26th at the Agios Ioannis Monastery, with traditional dancing and rich feast offering tasty delicacies. Most Melian residents spend the weekends or entire weeks in September at the monastery’s property, which hosts rooms (cells) with mattresses and kitchens that accommodate the villagers who maintain them clean throughout the year. This religious event unites the entire community as the locals socialize, dance, and finally take some rest from the summer season which at this time approaches towards the end. 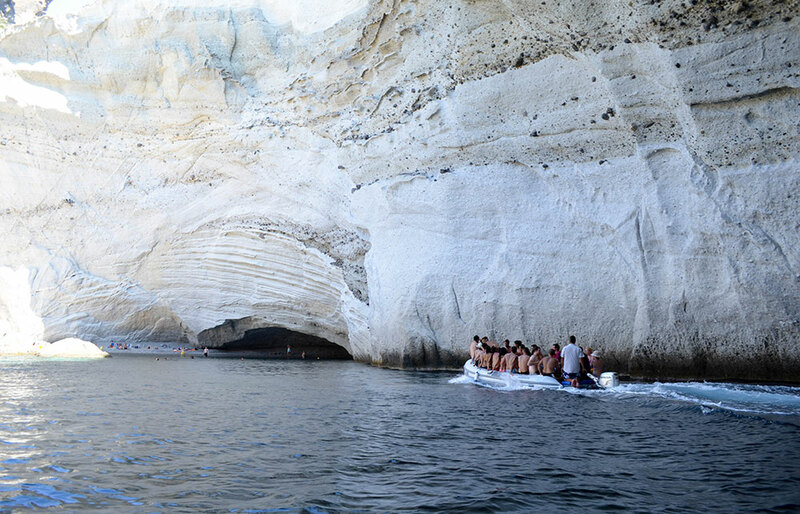 Festival of Milos: is the most important cultural event of the island. From May to September the festival introduces visitors to a broad range of artistic performances including concerts, art exhibitions, dance performances, film festivals and photography. Kyriavgoustos: is a local bonfire festival held on August 31 in Trypiti village, where locals of all ages jump above the fire to keep their houses warm in the winter according to the legend. 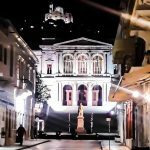 Treasure Hunt: is organized every February by locals and gives participants a chance to get to know the history and tradition of the island better, but also to have some fun.